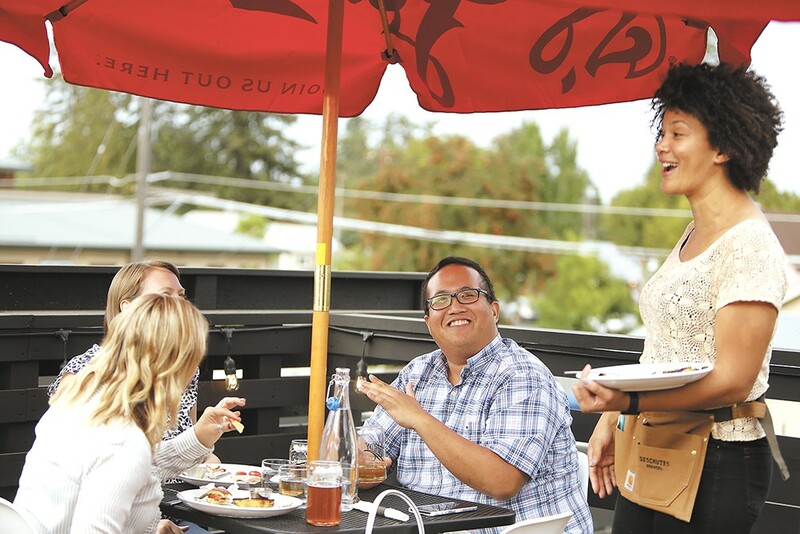 The rooftop patio has been a hit at Remedy since the restaurant opened last month. A lot of people drove by the long-closed dry cleaner at the far south end of Grand Boulevard and figured that it was a damn shame that the historic building was sitting empty in an otherwise flourishing area of the South Hill. Over the years, Matt Goodwin was one of those people, but he and his partners took it upon themselves to actually take the leap. Now the spot is home to Remedy, a restaurant and bar with a casual atmosphere but refined cuisine. 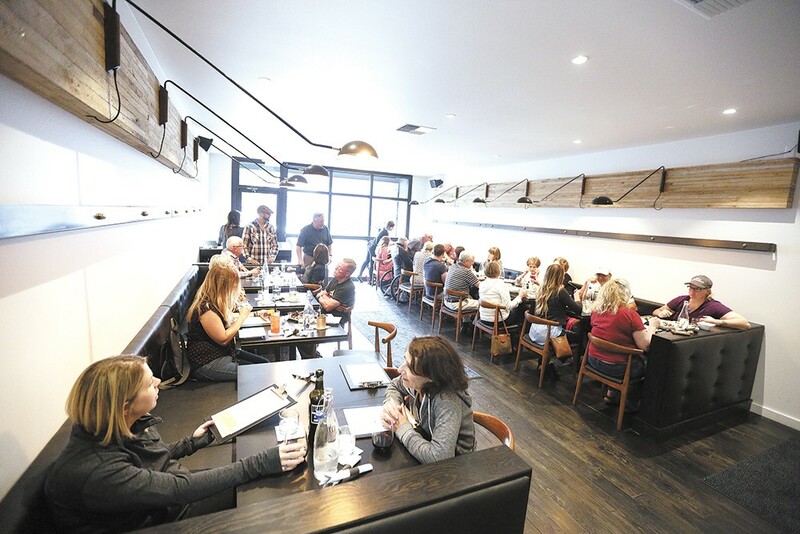 For Goodwin, the location was begging for a restaurant, considering the wait times for tables that can often be found down the street at Republic Pi and the Manito Tap House. "If you look at Republic Pi and Manito Tap House and Rocket Market — those are great neighbors and great restaurants that are always busy. We thought we'd fit in here," he says. Goodwin is owner or part owner of a number of other restaurants around town, including Fast Eddie's on the east side of downtown, the Boiler Room in north Spokane and the Backyard in the West Central/Kendall Yards area. He considers all of those spots to be unique to their neighborhoods and frequented by those who live nearby. That's what he's already seeing at Remedy. "We have people walking or riding their bikes here," says Goodwin. "I want all these places to have their own identity to their neighborhood." Remedy found a home in a historic building on the South Hill. You can get a peek of the upper South Hill identity — quite literally — from the rooftop bar at Remedy. There, you'll find eight tables perched atop on a newly constructed deck lined with lights. The roof has been popular, to say the least. "A lot of people coming in for lunch or dinner these first couple weeks have opened the door and there's no one [inside]. Everyone is upstairs," says Goodwin. When the weather cools, as it will soon, Remedy patrons will more likely be eating inside, where a throwback white-tile floor denotes the 1920s pharmacy theme Goodwin and crew originally conceptualized (hence the name), but admit they strayed from in order to fully realize the restaurant. The bar — where the extensive list of craft cocktails and Moscow Mules are made with an impressive arsenal of liquors — features 20 beers on tap, including several local breweries and regional favorites. On the south side of the building is another sizable fenced-off area that could accommodate live music or a beer fest come next spring. Of Goodwin's aforementioned restaurants, Remedy has the most upscale fare. That said, the current menu tops out at $18, and that's for a pork hash made with locally sourced pork rib-eye. The other options right now are a burger with smoked bacon ($14), a salmon sandwich ($14) and Greek fajitas ($16) made with chicken, artichoke hearts, peppers and more. On a recent visit, I went with the chile verde ($14), pork shoulder served with a rich sauce and Spanish rice piled up in the middle. Again, it's a limited menu that, at least when in your hands, is dwarfed by the extensive cocktail, beer and wine menus. Executive chef Justin O'Neill, who also developed the menu at the Boiler Room and the Backyard, is working exclusively with a wood-fired oven, and is waiting to ramp up the menu choices — including as many as eight additional entrées and a couple of appetizers — until they know they've got the firepower to accommodate more items. They're similarly waiting to dial in a happy hour and specials. Remedy also acquired the neighboring building formerly occupied by the Hop Shop, which means the restaurant has its own parking lot. In the coming months, that space will become a spot for Remedy to accommodate parties or special events. Eventually, there's a possibility it will become a breakfast spot or a beer and wine bar. They're still finding their footing, albeit with a big turnout come meal time, but Goodwin says things are coming together. Mostly, he says he's excited to have found another great neighborhood.